What is the quality of your photo booth? We use high quality photo booths that are built by a manufacturing company to high standards. Our photo booths come equipped with quality DSLR cameras, fast dye sublimation printers, and professional studio flash systems. Do you charge for setup and breakdown time? Absolutely not! 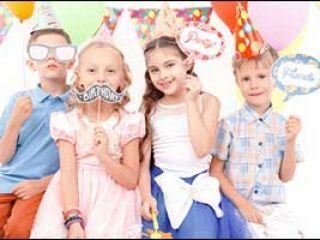 Every photo booth rental includes setup one hour prior to the event start time, as well as breakdown at the conclusion of the rental period. We allow 1 hour for setup. The actual setup time takes approximately 20-30 minutes once all the equipment has been brought to its spot. The time it takes to bring in the equipment depends on the location and whether or not it will need to go up stairs or an elevator. Don’t worry though! We will make sure to check with the venue beforehand and be completely ready to go at the agreed upon start time. I need the photo booth set up two hours before my reception because the ceremony and reception are at the same place. Is there a discounted hourly charge when the photo booth is not in use? We offer an hourly standby charge at half the cost of a regular hour. This is good when a photo booth needs to be set up extra early, or when it is used during a cocktail hour, idle during dinnertime, then used again during a reception. Will someone be operating the booth? Yes. We will have at least one friendly photo booth attendant at your event to make sure things run smoothly. 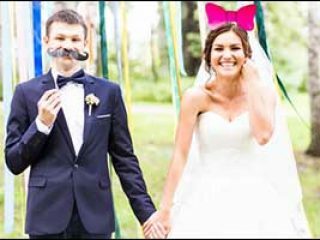 Do you have travel fees for photo booth services? There is no travel fee for events with 25 miles of zip code 97015. A $0.50 per mile fee will added for distances outside of the 25 mile travel area. Yes. A flat deposit fee of $150 is required to hold your date for our photo booth services. The balance is due before the start of the event. Can time be extended on the day of the event? Yes. Extra time can be added for an hourly fee. What is the minimum amount of photo booth rental time? The minimum photo booth rental period is two hours. Do you have any suggestions on how to make sure our guests take full advantage of the photo booth? We suggest that you let your guests know where the photo booth is located and that it is available to them at no cost. Some easy ways to do this would be to:Have an MC or DJ make an announcement.Provide a note at the table. Place a photo strip frame at each place setting as a gift that your guests will want to fill. Display a slideshow of the photo booth fun that it sure to draw a crowd. Does the photo booth have a view screen so people can see themselves before a picture is taken? Yes! In fact, all our photo booths are live view touchscreen so that it is easy for everyone in the picture to position themselves and see exactly how they look. Immediately after each picture is taken, the photo will be displayed to give a sneak peek before getting the strips. Are multiple prints included in the photo booth rental fee? Yes. After every visit to the photo booth, a copy will be printed for each person in the session. 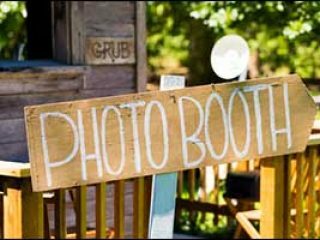 The minimum space needed for an open-air photo booth is 5 ft. by 7 ft., but more space is preferred. An 8 ft. by 8 ft. area is the minimum requirement for our enclosed booth. Also, an area for a 6 ft. table is necessary in order to hold props and other items. In addition, space for movement will need to be considered, especially in front of the entrance and near tables. We suggest placing the booth in a clear and uncluttered area away from the dance floor. A place near the bar or other close area where people are having fun is ideal. If space is limited, it can also be effective to set up in the hallway or adjoining room. People go where there is fun – and photo booths are FUN! Do you set up outside? We set up outside as long as the photo booth is protected from weather conditions such as extreme temperatures, high winds, or precipitation. The booth will also need a flat, dry surface with a main power source within 20 ft.
Do you bring fun props for guests to use? We bring a lot of props to add to the photo booth fun. We have hats, boas, goofy glasses, frames, beads, mustaches, and more. With a little creativity a dozen people (possibly more) can fit into each shot. Our most popular photo strips are 2” x 6” and include your choice of 3 or 4 pictures on each strip. We offer 4” x 6” and 5″ x 7″ photos as well. Can you print text, graphics, or a logo on the photo strips? Yes – photo strips can be customized. We can even change the background color of the strips upon request. It is important to reserve your date as soon as you can. Dates fill up fast, especially during peak times. 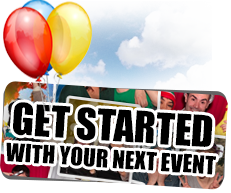 If you have an event that is in the near future, contact us right away. Do you offer a service for memory scrapbooks? Yes – it is a popular option for weddings! The memory scrapbooks are black with 10 black pages (actually 20 pages since the backside is used as well). Each side holds 4 photo strips, making it possible to hold 80 strips total. Once the strips are printed, guests use a glue stick or photo adhesive to place on a page. Then they use colored pens (silver, pink, yellow, green, blue) to write a message that shows up great on the black paper. At the end of the evening you will be given the scrapbook to enjoy immediately. Am I able to get a digital copy of the pictures after the event? A DVD or thumb drive is included in some packages, or it can be added onto other packages as another option. The digital copies will be provided to you at the end of the event containing photo strips and individual pictures. Will pictures be available online? An online gallery of all the photos is included with the Media, Combo, and Wedding Packages. You may choose to have the gallery password protected, or available publicly. At the beginning of each photo booth session, guests have the option between color, sepia, or black and white photos. They simply choose their preference from the onscreen display and that’s it! However, if you prefer not to give guests a choice, we can also set it to only do the option you choose. Is there a limit to how often people can use the booth? There is no limit. You and your guests can have unlimited visits to the photo booth during the time of the contract.